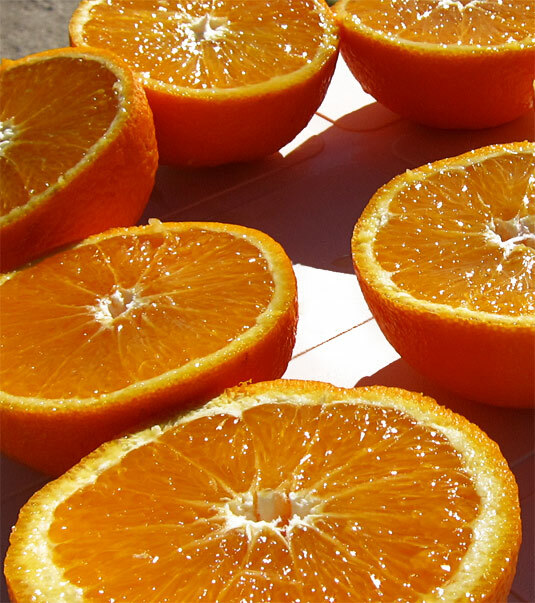 We have 4 varieties of organic oranges that ensure supply to our customers from November to May. Six months in which you shall be able to enjoy newly picked oranges of extraordinary quality and flavor. This diverse variety permits an ample availability of our fruit during the year. Navelina: It is the first crop to mature. We can serve it from November up to February or March. Perhaps consumers preferred table orange. Its juice is delicious so it can be used either at the table or for juice. Washington navel: Crops a bit later than the Navelina, but also very sweet. We can also serve it from November to February or March. An exquisite table variety, with a traditional flavor that reminiscent of the oranges we ate when we were kids. And its juice…. to be savored. Salustiana: A round fruits, of excellent and plentiful juice. We serve it from the end of December or early January to the end of April or mid-May. An orange with a lot of juice. Try it and decide how to take it, you will certainly like it for both table and juice. Cadenera: Our darling. A local variety of traditional crop in the municipality, our trees are more than 60 years old. We are possibly the only farm selling organic cadenera oranges directly to consumers. We serve them from January to April. A juice orange that will impress you with its genuine flavor full of history. To be relished.